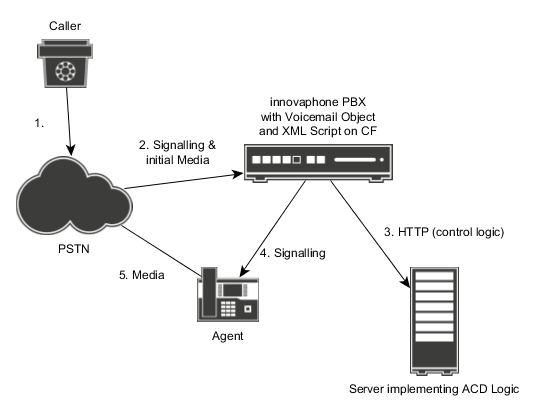 The innovaphone PBX supports a number of objects to implement various call-distribution schemes (namely Waiting Queue, Call Broadcast, Call Broadcast Conference and Voicemail ). Although this allows to implement quite sophisticated logic only using on-board tools, there are scenarios where the distribution logic shall be implemented in an external (presumably server-) component. The right tool do implement this is a custom XML script for the Voicemail object. Some simple examples how to do this are described in various articles (e.g. Howto:Simple Linear ACD with Voicemail XML Script, Howto:ACD with Voicemail XML Script and external Database or Application and Howto:Simple Round Robin ACD with Voicemail XML Script). All these scripts implement the main logic within the XML script and retrieve only some decision data from the server. However, if you intend to implement the complete logic on the server side, here is how. No media needs to be handled by the server. If any request to the server fails, the script will transfer the call to the configured fail-over emergency destination. Of course, you will replace the ACD server by your own and from this point on, there is no requirement for PHP or mySQL any more. put the routepoint.xml and prompts on the local CompactFlash card. In the PBX create a VoiceMail Object and provide the URL with the Path to the routepoint.xml. If you are running newer firmware, you should uncomment the code for the fwd-end event. This is not a ready-to-use sample, it is rather a technology showcase. If you are interested in using it with your own ACD server, send an email to presales@innovaphone.com. http://download.innovaphone.com/ice/wiki-src#routepoint - download the complete file package of scripts and files described in this article. This page was last modified 14:45, 12 May 2016. This page has been accessed 7,293 times.